Place 1/2 cup of cornmeal in a container. Add 2 envelopes of Kool-Aid (unsweetened drink mix) for every 1/2 cup for the best color and scent. Add about 1/4 tbsp of water. 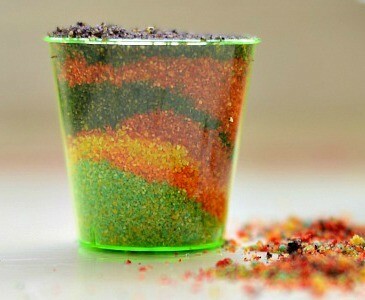 Water is added for the drink mix to give out its vibrant color and scent. 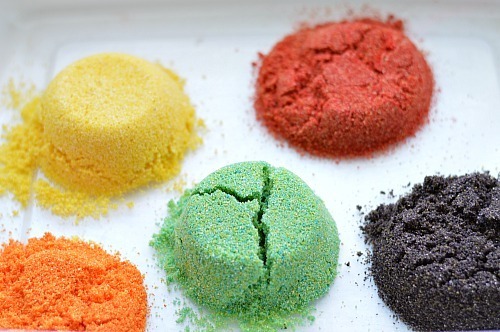 Mix thoroughly with hands or a spoon until the color spreads evenly. If you want a more moldable sand, add more water.. Place them in separate containers and place the lot in a big shallow plastic tub. The children can enjoy the colors first and then we all know what happens! They enjoy the mixing process even more. 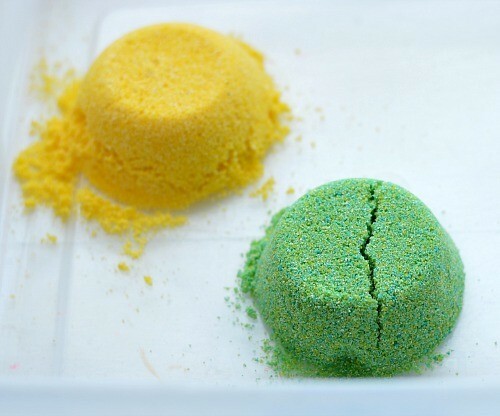 Cornmeal in itself is a fantastic sensory material. 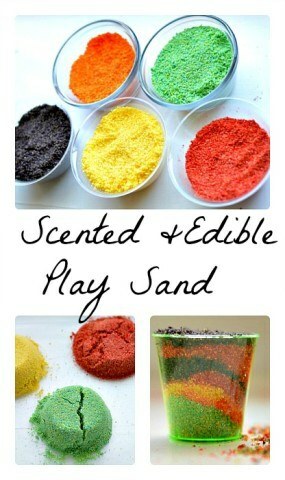 We first used it in our alphabet sensory bin. Then in our desert sensory bin and in our fall activities for math post. 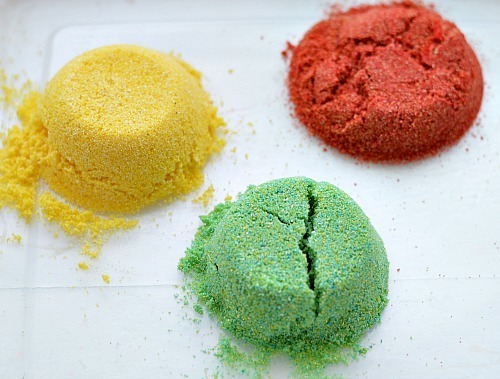 Note: remember the cornmeal is yellow and the color you add with mix in and give you a secondary color. 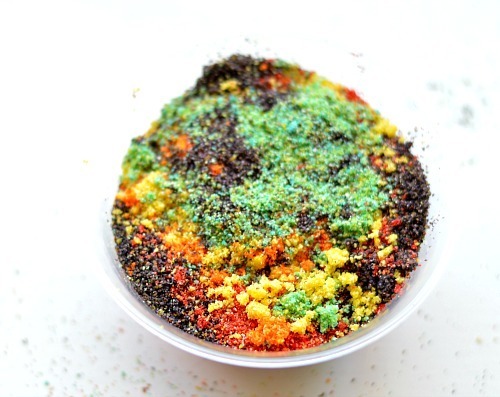 The green sand you see is actually cornmeal and blue Kool-Aid. 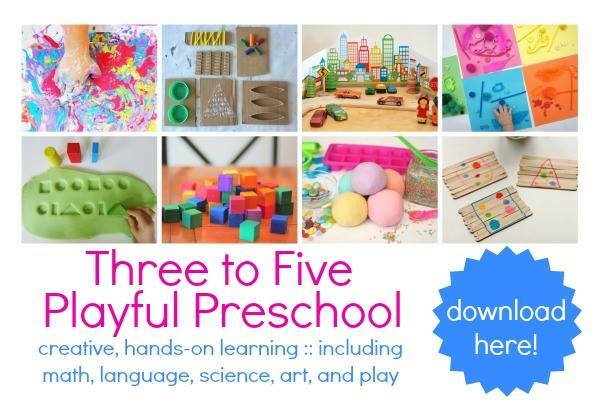 Check out our resourceful e-book filled with many preschool play ideas. 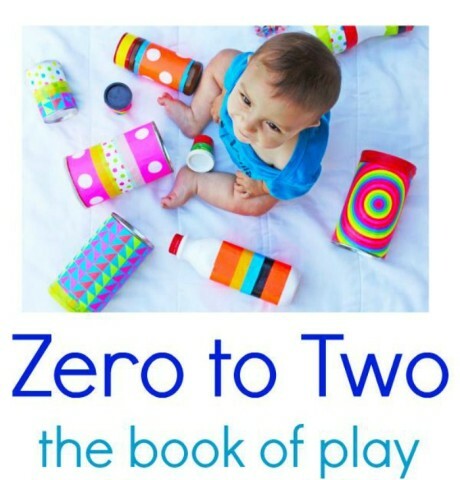 We have also collaborated on another e-book with simple and practical baby play ideas. 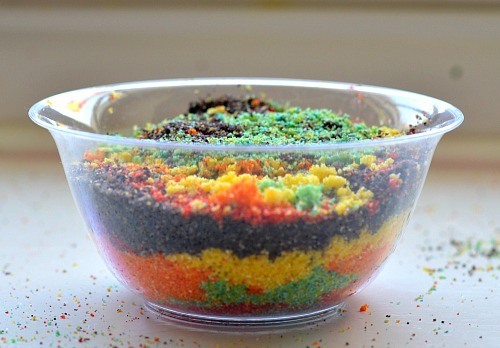 How did you make the black sand? I used grape Kool-Aid.. It’s dark purple rather than black. Kool-Aid does stain a bit. But it washes off with some soap and water. Yet again; thank you for sharing your great ideas. Appreciate these hints and tips. Love this idea!!!!! Does it stain the hands? A little bit because of the Kool-Aid. But the person making the sand will have stained hands which will go with some warm water and soap scrubbing. But the children will be fine without any stained hands since the color would have settled in with the cornmeal. The children also would probably use tools like shovels and scoops. 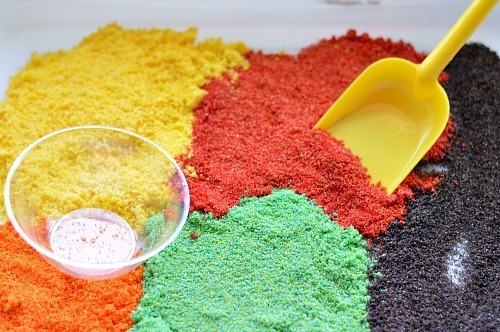 The person making the “sand” can easily avoid the stain by using forks or spoons to mix the color in. I am highly sensitive to smell. I know that the smell from the Kool aid would drive me bonkers 😉 any suggestions for coloring without scent? Probably food color mixed with a bit of water will do the trick. Even liquid watercolors will work. Love it! 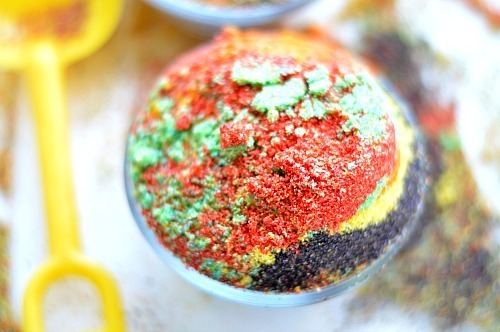 The colors are so pretty too! That looks like great fun! What would you suggest the equivalent to Kool Aid and cornmeal is in Australia? Cornmeal is used to make polenta, so it may be called something different. Kool aid is a powdered drink mix, like a cordial powder (kinda) hope that helps!